A few weeks ago I was contacted by EverydayHealth.com to partner with Joy Bauer’s Food Cures program. Usually I don’t dig commercial diet plans, but this one is different. 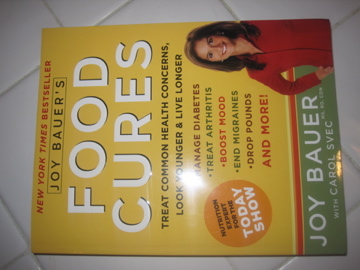 In case you aren’t familiar, Joy Bauer MS, RD, CDN is the Nutrition Expert for The Today Show. She also works for Yahoo! and Self Magazine and is even one of the guest lecturers at Integrative Nutrition where I’m currently enrolled! Joy’s program is centered on the idea that diet 100% affects our health. Bad diets can create health problems, but a good diet can help cure or lessen the symptoms of a health problem one currently has. This natural approach to health is one I totally agree with. While I do know there is a time and place for modern medicine, I love that there are ways to get healthy without it. I received two of Joy’s books to read and review. The first was the guide to her program, “Food Cures”. This book’s chapters each focus on a common medical or health issue, including weight loss, healthy hair, cardiovascular disease, type 2 diabetes, memory, migraines, and even PMS. Each issue is described in detail and it’s common causes are listed. Then Joy goes into how lifestyle and eating habits affects the issue negatively and how food and nutrients can also affect it positively. She disucceses specific foods, vitamins, and nutrients and how they work inside the body. It’s neat to know which foods contain the vitamins that will help put me in a better mood! At the end of each chapter Joy presents her “Four Step Program“. Admittedly, lots of the recommendations in this book are pretty basic: Lose weight. Eat more whole foods. Eat less processed junk. Do those things and almost ANY health or medical issue will improve. But it’s really nice that Joy has created specialized plans for 16 common problems. For people that are really looking to cure just one or two health concerns through diet and lifestyle changes, this book is perfect. You can dig deep into the problem at hand, figure out if what you’re currently doing might be exacerbating it, and then figure out how each of your meals can start to make it better. I love that the science behind the food recommendations is given so readers actually learn why they are eating them! 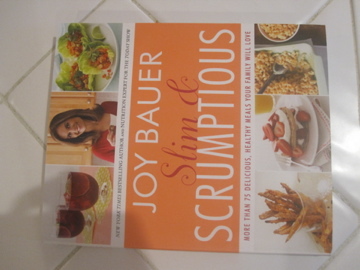 The second book I received was Joy’s cookbook Slim & Scrumptious. Joy is not a trained chef. She acknowledges that. But she does have great no-fuss recipes for delicious and healthy meals. There are breakfasts, desserts, snacks, soups and salads, and side dishes as well as meat-based, and fish-based mains. 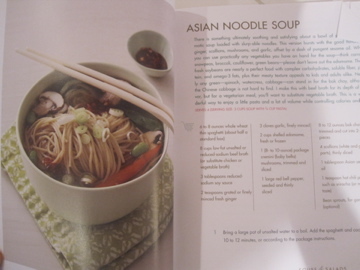 I flipped through this cookbook and starting folding down corners like crazy! 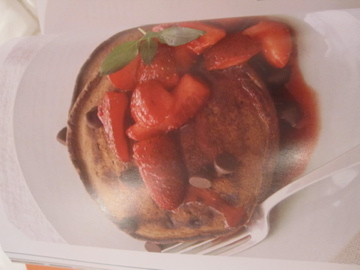 Double Chocolate Pancakes with Strawberry Sauce? 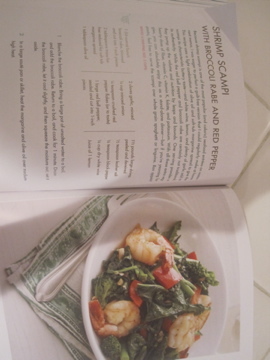 Shrimp Scampi with Broccoli Rabe and Red Pepper? These recipes are perfect for someone simply trying to create healthy meals in the kitchen without getting into crazy ingredients or complicated techniques. I can’t wait to start trying them out in my new Dallas kitchen! I think Joy Bauer’s Food Cures Program is a great change to the many commercial “diet programs” out there because it’s not a “diet”. It’s not about eating very little calories or removing a food group. It’s about getting healthy, curing real medical problems, and cooking real food. It’s definitely a program I can stand behind! ← Overnight Oats…In A Jar! thanks for the info about this – love the sound of some of these recipes and heart that it has simple not ‘crazy’ ingredients! I HATE the ones that call for things I can’t find in 7 grocery stores in Atlanta! Those look like great books! I 100% agree with the idea that the food you eat affects your health- I have seen it in my own life so clearly which is why I’m really committed to healthy eating. Of course I love to have splurges and sweets too but I just feel better when 90% of the food I’m putting in my body is healthy! And those recipes look so great- I might have to check it out! Well that sounds like an exciting gig. Will you be partnering with them? Thank you for posting about this, Clare! I definitely want to check her books out now!